Statistics Canada released a report late last month that outlined revenue from short-term rental accommodations - like Airbnb - across Canada. This industry is growing rapidly! In 2018 alone, short-rental accommodations created $2.8 in earned income for hosts and platforms. Of note, $2.6 billion or 93% went directly to hosts. The most popular provinces in terms of short-term rental income were Ontario at $900 million, British Columbia at $876 million, and Quebec at $600 million. 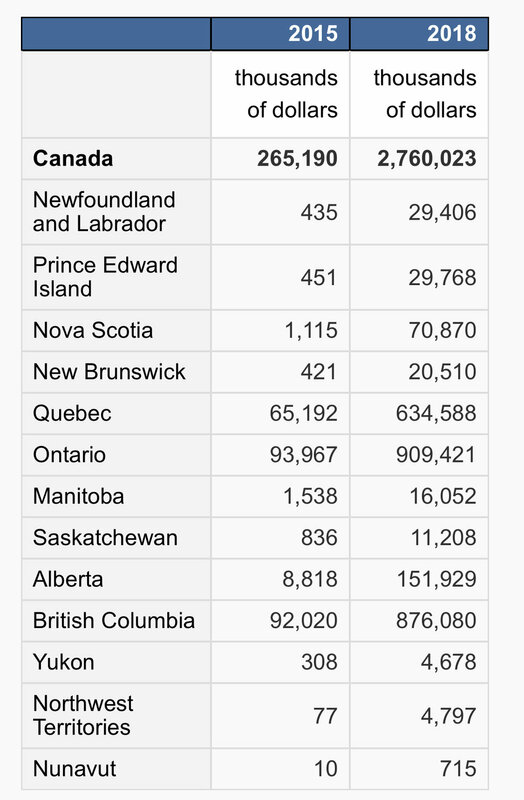 These three provinces accounted for 90% of all revenue generated across Canada. Almost as important is the growth this newer class of digitally-enabled property has generated since 2015. Across Canada, revenue from short-term rentals jumped from $265 million in 2015, to $2.8 billion in 2018. That’s an increase of 1056% over the course of 4 years.